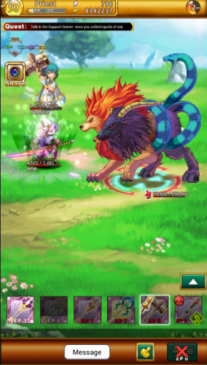 Logres: Japanese RPG is an F2P mobile MMORPG where you take on the role of a hero battling against the dark force that threatens the Kingdom. 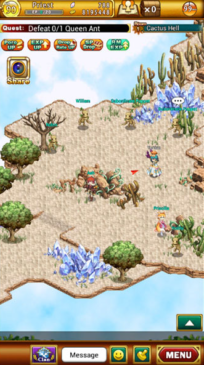 The game is centered around a Turn-based battle system that allows you to target your enemies before their turns. You can team up with other players by picking an ally at the start of every quest. Any players near you will be able to join in and help you overcome the challenge before you. 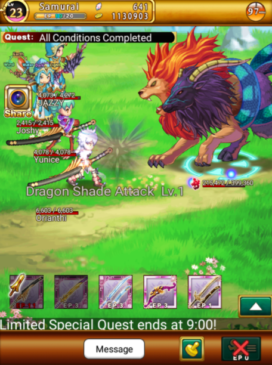 With easy controls, many quests, and fun challenges that you can do with friends, Logres is a good choice for any JRPG fan who wants to play a simplistic MMO on mobile devices. While the character creation process is pretty limited in Logres, you’re able to make yourself slightly different from everyone else. You have a few options like skin color, hair color, and a few different style choices for those, but for the most part it’s pretty limiting on customization (similar to a JRPG heh). You pick your class from one of 5 classes, each with their own skills and role in the fight. What makes the class system unique and fun is that there are options to change class freely as you level up and unlock them. Even though you only start with 5 choices, they will quickly expand into over 15 more as you earn experience through your questing. After you’ve selected your class and appearance you’re thrown into the game world where you can begin your journey to fight against the Dark Forces. This game brings a heavy emphasis on the JRPG part, from earning experience to learning skills and meeting other characters. If you’re someone who really enjoys the RPG genre at it’s classic state, you’ll love how you’ll be familiarized with the controls and how the skills work right from the start. While there’s not too many skills to overwhelm players, there are certainly some good ones with unique animations and effects. The best part is, you can mix and choose whichever skills suite you best. As you start each quest you can choose whether or not you want allies to go with you. You can do things alone of course, but it’s always more fun taking friends along with you. You’ll fight in a party of up to 5 players or NPC characters in each quest and you’ll eventually be able to take the challenge of dungeons as you level up. The game world itself is actually rather large for a mobile game, spanning over various regions with their own challenges for you to enjoy. The anime art style brings the world to life with brightly colored scenes and detailed enemies and NPC’s. The way the world is presented is done pretty well as everything goes with the lore and certain regions appear as they do because of how the lore has effected it. The story behind each quest is nicely presented as well with easy to follow instructions on what they expect from you and so on. For the most part, everything is a kill quest since you’ll be doing battles in pretty much everything, but the quests still show you around many of the beautiful regions filled with life and other players making it a fun experience for anyone. Initially you’ll look like most other players after you start playing, but this will change as you progress. You’ll get various items when you quest, and each of the equipment items can be used cosmetically as your own custom outfit. So, whether you want to wear that grass skirt or a bear costume with fairy wings, you’ll be able to customize your look in an almost endless number of possible outfit combinations. This definitely adds value to the game for me as I’m not a fan of looking like everyone else, so for me, I decided to go with a big hat and some kinda kitty outfit. It looked pretty cool, and wasn’t seen on very many others so I was happy with it. There are many ways to customize your character after you get going, so be sure to experiment and choose which one is your personal look! 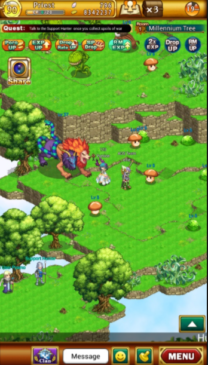 Overall Logres is a fun and casual style JRPG MMO which gives anyone a simple way to game with friends if they don’t have the time for larger games and all their required times for certain events in the game. Whether you’re going in alone to take on the full challenge of the dark army alone, or pairing up by using the auto-party or co-op party mode, you’ll get to play through a plethora of quests each with their own unique goals and challenges. As you level, you’ll get many more options opened up and it really gives a more open world feel to this simplistic 2D MMORPG. Since the game has several regions, the characters in those regions are all unique to the region they are in with different speech patterns and appearances which makes the world seem more varied and alive. Simple things like that make a game more fun. Either way, if you’re looking for an MMO that doesn’t require much focus or time, Logres is a good one to check out. You can check out the game’s main site here!